The forecast for Saturday looks stellar. Too warm for ice, plenty warm for saling unfrozen water with open-palm mitts or light gloves. 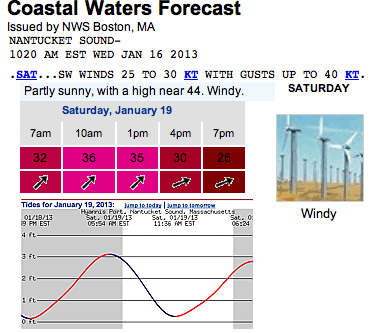 The iWindsurf "Quick Look" forecast will drop a few mph today, but remain around 30. I hope to see a few sails on the water! I was trying to hold off saying anything as to not jinx. I like the glider CAM Jerry! Enjoy the warm winds this Saturday, then hunker down for a serious cold snap stretch for 15+ days as the Arctic blast gets discharged! Sunday lookin good too, more of the same, sunny, high near 45. Almost tropical! Yes, Sunday may be great, too. It's supposed to turn W-WNW in the late afternoon, though. If that happens earlier than predicted, Sunday afternoon may not be great, at least not on the south side of the Cape. In the past few weeks, winds often have been a bit more northerly than predicted, or turned & dropped earlier. Nina and I will be at Kalmus. Posted: Thu Jan 17, 2013 8:33 pm Post subject: Horseneck? Would Horseneck on Sunday be totally crazy? Block Island is slated for 9ft waves, wind would be howling and fairly side shore. But then, it will be pretty chilly. I am thinking Coast Guard on Sat. and possibly Horseneck on Sunday. A SSW usually builds a wrapping swell at CG. If it is totally flat will look for other options.